Taken a few days ago after I managed to drag myself away from the gallery to get some new landscape images. This scene is a short walk from Eagle Bay and on the right day you get some pretty cool waves there. Still with the recent sightings of a great white and two hammerheads 200 metres off shore it is better to just imagine what the water would be like. I wonder if the guy on the yacht is happy………………………. probably a big YES!!! Hell the rest of us were working. Even me!! This was a hard shot to take as the flies kept getting in the way. Forget dust spots on the ccd, I was spotting flies!! It was also hot, oh I wish I had a 9 to 5 office job, anyone want to swap??? Hmmm air-conditioning, fluro lights, bosses, bad tea, annoying co-workers, peak hour traffic, thats the life for me. ~ by christianfletcher on January 20, 2010. 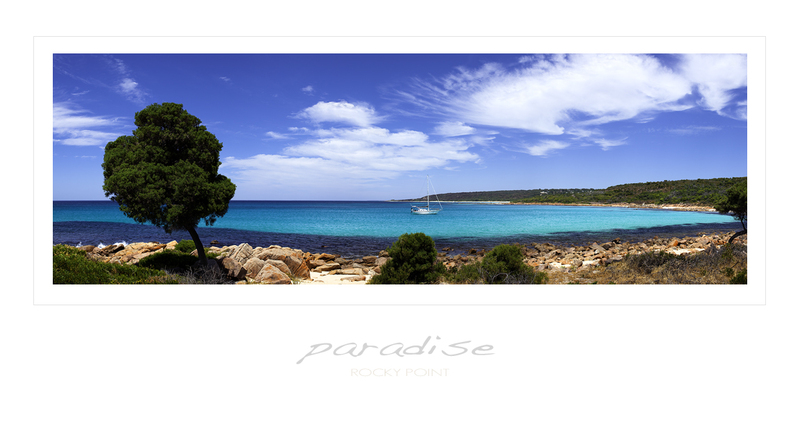 Nice pic by the way, is Rocky Point between Eagle Bay and Meelup?. One of my favourite surf breaks mate and nicely captured for sure! If I remember correctly, I was talking to you on the phone when you were taking this shot and that tree on the left is where I leave my gear when I go out there! A very nice CF classic capture – sorry to hear you suffered so intolerably to get it but that’s the life of an artist I guess. I’d swap you jobs for a while but I know you don’t like pain, blood or smelly smells. The guy on the boat is probably below decks reading photography books under a fluoro light, wondering why he can’t seem to capture the beauty down there the way pro’s do. He’s probably going to head off and buy a 5D2 shortly. A Yep again …. 2 in a row , unreal from me. The guy on the boat is probably running his business from there, making the rest of us look ordinary. Excellent shot CF. Love it. I really feel for you, you have it hard down there! Good to see the boss out there doing what he does best!! GOod shot Christian, I like this one better then the one with the crooked horizon. nice little plug there stakky, finnaly you show us what you have been doing with you 5d. Hey Christian how can I get a link on the side of your blog? If I have to get better shots then I guess I can wait a while haha. Hey CF this is fletcher of old. It is great to hear your out and amongst it. Isnt that what you do and do so bloody well it makes the rest of us just weep or drink, I know I drink, Merv smokes and mark just goes to Rotto ! I was down at Eagle Bay not too long ago and this photo perfectly displays what I remember about it, crystal clear water with no sign of a wave anywhere. Whilst I was down south I had a look around in your Dunsborough gallery (on 4 separate occasions) and your photos looked even more amazing in full print than they had done on a screen. I found your gallery both breathtaking and inspiring. Awesome! Stunning. Guess I will need to make a trip west this year after seeing your photos of the past week. Who knows – I may even borrow the yacht.